In small bowl, mix all rub ingredients. Fold wings of chicken across back with tips touching. Tie or skewer drumsticks to tail. Sprinkle rub inside cavity and all over outside of chicken; rub with fingers. Insert ovenproof meat, grilling or digital thermometer so tip is in thickest part of inside thigh and does not touch bone. Heat gas or charcoal grill for indirect cooking. For two-burner gas grill, heat one burner to medium; place chicken, breast side up, on unheated side. 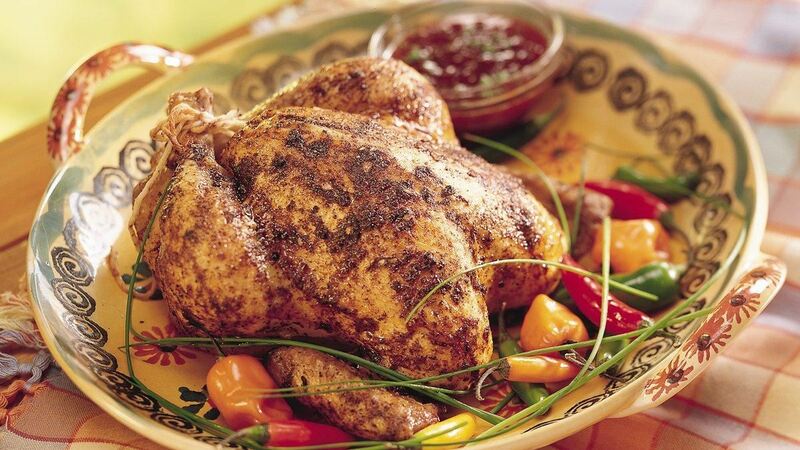 For one-burner gas grill, place chicken, breast side up, on grill over low heat. For charcoal grill, move medium coals to edge of firebox; place chicken, breast side up, on grill rack over drip pan. Cover grill; cook 2 hours to 2 hours 15 minutes, turning every 20 minutes, until thermometer reads at least 165°F and legs move easily when lifted or twisted. In 1-quart saucepan, mix all sauce ingredients; heat to boiling. Reduce heat; simmer uncovered 5 minutes, stirring occasionally. Remove chicken from grill; let stand 10 minutes. Serve chicken with sauce.